So is weed legal in Vermont? Yes. As of July 1, 2018, adults 21 and older can grow up to six cannabis plants (two mature and four immature) and possess up to an ounce of flower. In January, Gov. Phil Scott signed into law the bill that legalized small amounts of marijuana. The sale of marijuana remains illegal as the law did not create a taxed-and-regulated system, as is found in several other states. Stay tuned for updates. Is medical marijuana legal in Vermont? Yes. Medical marijuana has been legal here since 2004. Patients can grow their own in a "single, secure indoor facility" or have a registered caregiver cultivate it for them. The state is served by four dispensaries: in Burlington, Montpelier, Brandon and Brattleboro. One more, and a satellite shop, are expected to open next year in St. Albans and Bennington, respectively. Each is registered with the state and, according to state legislation, "may acquire, possess, cultivate, manufacture, transfer, transport, supply, sell and dispense marijuana, marijuana-infused products and marijuana-related supplies" to registered patients and their caregivers. Only patients with debilitating medical conditions can get on the registry. Specifically, the State of Vermont defines those conditions as: "cancer, multiple sclerosis, HIV, AIDS, glaucoma, Crohn's disease, Parkinson's disease — or the treatment of these conditions, if the disease or the treatment results in severe, persistent, and intractable symptoms." It also recognizes: "post-traumatic stress disorder, provided the applicant is undergoing psychotherapy or counseling with a licensed mental health care provider; or a disease or medical condition or its treatment that is chronic, debilitating, and produces one or more of the following intractable symptoms: cachexia or wasting syndrome, chronic pain, severe nausea, or seizures." Is hemp legal in Vermont? What about CBD? Yes. Both are legal in Vermont. The amount of hemp grown in Vermont has increased exponentially in recent years and has led to a surge in products — foods, supplements and ointments, for instance — containing cannabidiol (CBD), a chemical compound found in cannabis. Unlike its close cousin, marijuana, hemp is high in CBD but contains less than 0.3 percent THC, the psychoactive chemical compound that gets users high. And, unlike marijuana, it's been legal to grow hemp under state law since 2013. While cultivation remains illegal under federal law, authorities haven't targeted local growers. How is decriminalization different from legalization? Vermont decriminalized marijuana in 2013. That means getting caught with an ounce or less of weed brings a civil charge, not a criminal one. A first offense is a $200 fine, a second offense, $300; every one after that costs $500. Possession of anything more than an ounce is subject to criminal prosecution, as is cultivation of marijuana plants. When will weed be legal in Vermont? July 1, 2018. 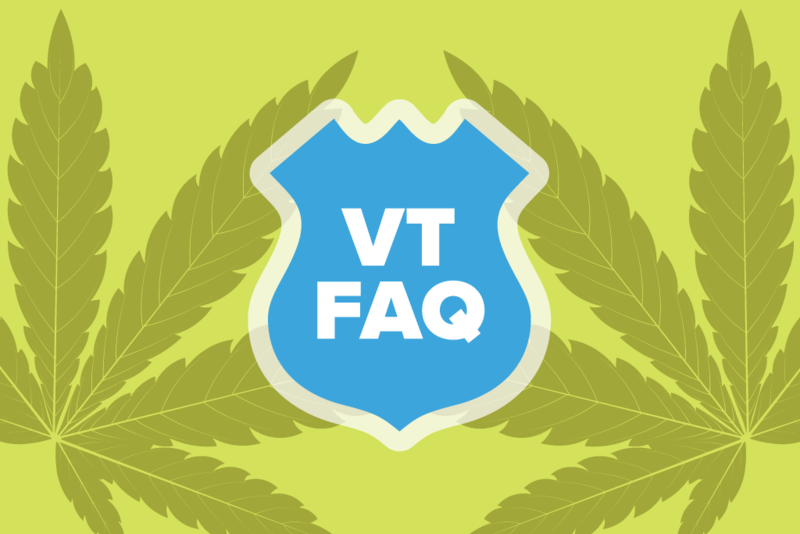 Vermonters can possess up to an ounce of marijuana and grow two mature plants and four immature plants. The sale of marijuana will remain illegal. If I'm a medical marijuana patient in another state, can I use my card to pick up weed while I'm in Vermont? No. The same goes for holders of a Vermont medical marijuana card, which entitles them to use, possess and buy cannabis only in the Green Mountain State. Got a question about cannabis in Vermont that we didn't answer? Send it to cannabeat@sevendaysvt.com.